Stained glass windows have long embodied creative inspiration, both by the artists who make them and those who view them. While creating an actual stained glass window may be out of reach for most of us, it is possible to make ordinary photographs look like stained glass windows for use in all sorts of arts and crafts projects. Most photo-editing programs have a variety of filters that allow you to change the photo in just a few short clicks. Two popular programs, Adobe Photoshop and GIMP, contain filters that make this process effortless. Open your photo in Photoshop by clicking “File > Open” and choosing your image from its folder. Click “Filter > Texture > Stained Glass…” from the menu at the top of the screen. A new window will open with options for manipulating your image. Drag the bar under "Cell Size" anywhere from two to 50. The higher the number, the larger the stained glass “pieces” will be, resulting in less-distinct image detail. Adjust the bar under "Border Thickness" to a value between one and 20. The higher the number, the thicker the space between pieces becomes. The borders crop into your image, rather than spacing the pieces out, so thicker borders result in less detail. Drag the bar under "Light Intensity" between one and 10. This targets the lightest areas of your photo, effectively increasing contrast. Click “OK” to confirm the options and convert the photo to the stained glass pattern. Click “Save As” to save the stained glass image as a new file and retain your original unaltered photograph. Open your photo in GIMP by clicking “File > Open” and choosing your image from its folder. Click “Filters > Distorts > Mosaic…” from the menu at the top of the screen. The Mosaic options window will open. Choose the shape of the pieces from the drop-down menu. The selections include squares, hexagons, octagons and squares, and triangles. Adjust the tile size by dragging the bar or entering a value in the box. The higher the number, the larger the pieces. Use the "Tile Height" option to give the pieces a three-dimensional look by providing a light source. A value of one makes each piece contain just one color, looking completely flat. A higher value adds a gradient of light, adding dimensionality. 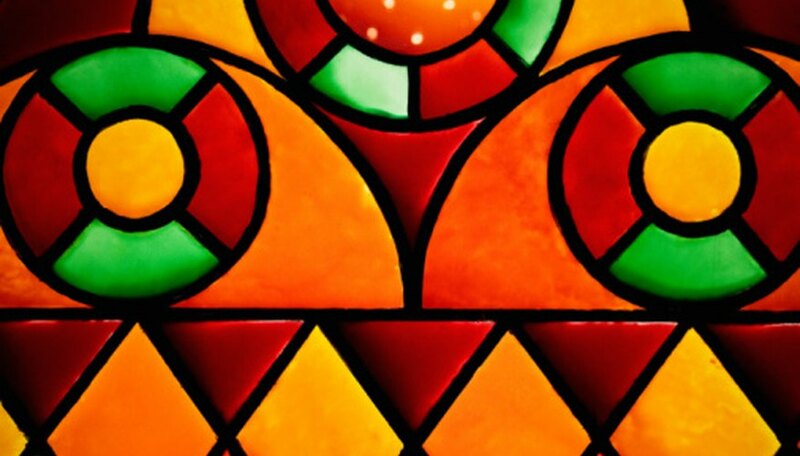 To achieve a truer stained glass look, leave this value at one. Control the thickness of the border between the pieces by adjusting the "Tile Spacing" bar. Drag the "Tile Neatness" bar to a lower number to make the piece shapes more haphazard, or to a higher number to make the shapes more uniform. Use the "Light Direction" bar to choose the angle of light that highlights each piece. Drag the "Color Variation" bar to a higher number to create a wider variation of colors, or leave it on a lower number to keep the colors more uniform and closer to the original image. Click “OK” to make the changes, and “Save As” to save this altered image as a separate file. Choose photos that best lend themselves to stained glass patterns. These are photos that feature a clear object and have delineated patches of color with little gradation. Simple objects with clean lines work best, such as an apple, a sunset, a cross or a pair of dice. Create original stained glass images for a wedding album or church group brochure. Apply the images to your business cards and letterhead. Or put them on mugs, plates, place mats, refrigerator magnets, bumper stickers and other personal items.